This was posted on the Neverwinter forums a while ago... They're planning on patching it in a future update (but who knows when?) so take advantage of it NOW while you can!!! Frozen Power Transfer Feat: Fixed an issue where this could extend the duration of all other effects on the Control Wizard. CW exploit how to one shot bosses. Spec into thaumaturge tree making sure to get Frozen Power Transfer. This allows you when auto attacking with chilling cloud to build hiding stacks that increase the damage of non Dot Aoe damage spells (Chill strike in tab, Steal time, Shield, icestorm.). You have about a 8-10 second time to auto attack before your stacks fall off. Within just a few minutes of auto attacking the training dummies I was up to 1million damage with chill strike. All you have to do in dungeons is just keep chain pulling to keep building up stacks. EDIT: This does not work without Evocation Rank 3. Just tested. One Shotting the last boss in CN. Please fix this! These are the feats I run to make this happen. Last edited by ccrackheads; 08-04-2013 at 12:58 PM. It looks as though you've copied and pasted the bug report from the official forums. Many people already replied there that it doesn't work as described so it either doesn't work or it's not described properly (my guess as it's very poorly worded). I've tried it as stated and it doesn't do anything. If you'd care to explain it properly step by step then that would be appreciated. 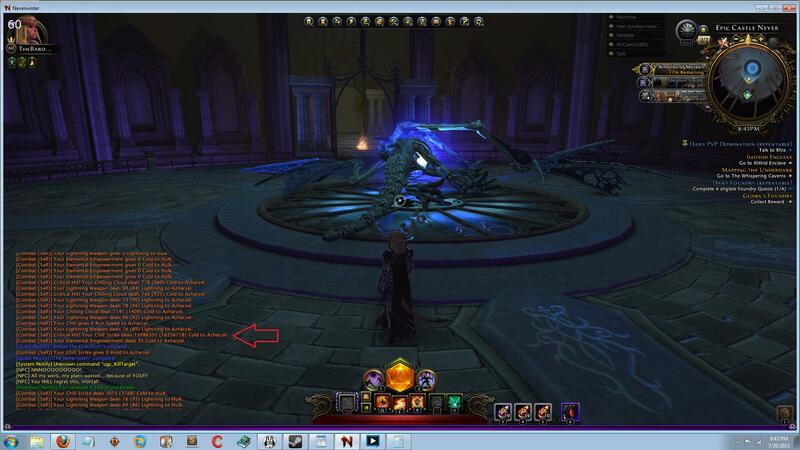 Yeah, I just copy/pasted it, hence why I provided the link to the Neverwinter Forums where I took it from. I'm not looking for recognition for it or anything, just trying to give a heads up on it before it's patched. Honestly, I don't have a free CW to test this with right now (I'm not going to respec my main toon just to mess with it) and haven't attempted it. So apparently IT IS WORKING... It's just a matter of figuring out what exactly you need to make it work. working, but still looking usuless. because u need stack damage 10+ min. Can you explain how it's done? If you switched to a low damage weapon (find a level 1-2 orb) and had a few slow moving mobs (like a couple hulks), you could easily avoid them while dealing minimal damage and building stacks. Then switch back to your lvl 60 orb before going after the boss..? edit:nm saw another video he posted. pretty sure I use chilling cloud long enough to have seen an increase in aoe spells but nada. I didn't turn round and hit something I wasn't building stacks on though, I'll try that next time I'm on. Last edited by RyanPatrickBrothers; 07-27-2013 at 09:15 PM. Yikes... After a almost month of draco farm this is finally public.. oh well.. I honestly didn't expect this one to stay undercover for this long. This bug needs extensive teamwork. (Impossible to do with zone chat PUGs) Maybe the biggest reason why you didn't hear about it till now. You need Frozen power transfer AND rank 3 Evocation. Basically bunch up the mobs with Singularity, keep them tagged with with 3rd hit of Chilling cloud. Use Shield, Steal time and Chill strike as much as possible to rack up damage quickly. Stacks stay for about 8 seconds~ in my experience so be careful as you clear the mobs if you wipe everything you wont have anything to hit with Cloud. Zombie hulks are awesome for this job don't kill them! This explains a lot, thank you. Yeah, it's actually been floating around for a month or so... Just someone finally dropped it on the NW forums and youtube, so I figured I'd make mention of it here so people can take advantage of it before it's patched. I heard about it about weeks ago but never bothered to try it because I didn't know the exact feats/skills that you needed for it. Thanks for the more in-depth explanation about how to do it! Sounds like it's a little painful to get working right (especially if you want to 1-shot the CN boss, but I'd settle for 3 or 4-shotting it) and takes some real teamwork to take full advantage of it. Last edited by ccrackheads; 08-05-2013 at 06:49 PM. Anyone tested and found if this still works or if it in fact got patched? I only see people say they 'think' it got fixed and remember, this is PW, nothing important/gamebreaking is a priority. Hunter MM Aimed Shot bug.